Irish nachos get their name from the fact that they are basically like any other traditional 'nacho' except that they are made by using potato rather than tortilla chips, and are often served in any pub along side a beer! Of course, they are not generally the most healthy option that you can find. With St. Patrick's Day right around the corner, I thought I would give this classic a healthy twist in honor of my Irish heritage. So how does one go about making nacho's healthier? Well, I gave it a lot of thought and finally came to the conclusion that I needed to bulk the potato up with lots and lots of other vegetables. Roasted vegetables at that! I also made a lot of health conscious substitutions such as swapping the sour cream for greek yogurt and using gold potatoes instead of the typical larger russet. I also kept the skin on my potato, as I almost always do. Why? That's where a majority of the nutrients can be found! 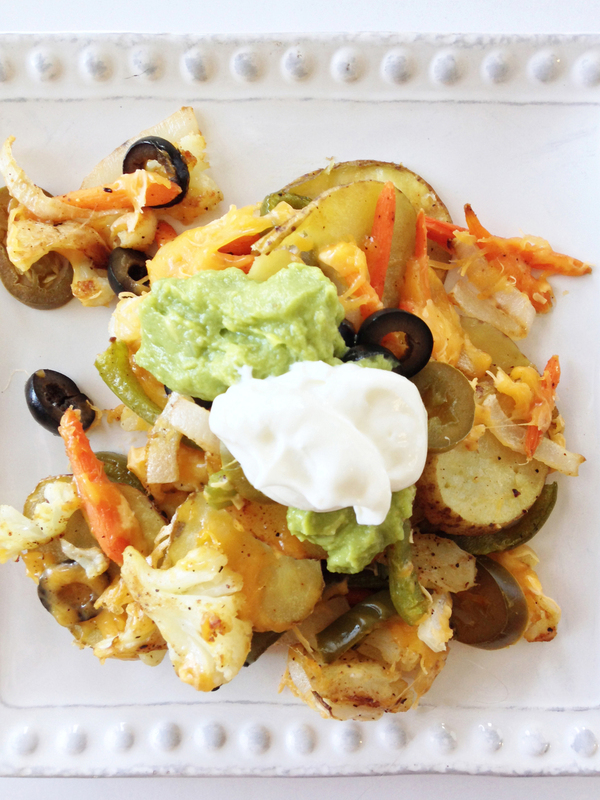 The addition of more vegetables to these nachos went over phenomenally! This was such a filling meal that I even debated listing it for 3 servings rather that the 2, but... with the calories being so low and my tummy satisfied, I didn't (and wouldn't) change a thing! Preheat the oven to 400 degrees F. and line a baking sheet with foil or lightly spray it with non-stick cooking spray. Spread the vegetables out over the prepared baking sheet. Sprinkle with salt & pepper and set aside. Lightly spray the inside of an oven safe skillet or cast iron skillet with non-stick cooking spray. Arrange the potato in the bottom of the skillet. NOTES: I gave my potato and vegetables a little pinch or two of homemade Taco Seasoning. I also like to slice and soak my potato in ice water for about 20 minutes and then pat dry. This helps them to be more 'crisp' and firm when baked. Give the potatoes and vegetables a light spray of non-stick cooking spray over the top and place the skillet and baking sheet into the oven and bake for 20-30 minutes. Once the potatoes and vegetables are starting to become tender, remove from the oven. Carefully transfer the vegetables over the top of the potatoes. Top with the jalapeño slices, olives, and cheese. Place back under the broiler and cook for another 3-5 minutes or until the cheese has melted. Once done, remove from the oven and serve with salsa, guacamole, and greek yogurt. Eat right away and enjoy!